Match gems to trigger the Luminous Stones to beat the level! The Wallerbog wants to play a game! Beat 5 levels in a row without losing a life to win the rewards he's been hiding! Do you have the power? Charm three amulets by completing missions to unlock a special reward! Crack open the Book of Moors to release 60 new levels! Play to earn magnificent prizes and rewards by joining the mighty Balthazar in this brand-new event! Play to unlock the next two enchanting chapters of the Book of Moors! Make matches with the Reflective Ore to beat the level. Match next to the Reflective Ore and watch its color change! Uncover the keys hidden on the Saga map by beating levels! Collect enough keys to unlock magical rewards & prizes! Magnificent! Soon you will be able to start each level with one of the new Booster Packs! Purchase a Pack with Magic to automatically begin a level with exciting Power-Ups that will help you beat dangerously difficult levels! Be on the look-out for new enchanting Bundle Packs including Magic, Power-Ups and more! More spellbinding levels now available! 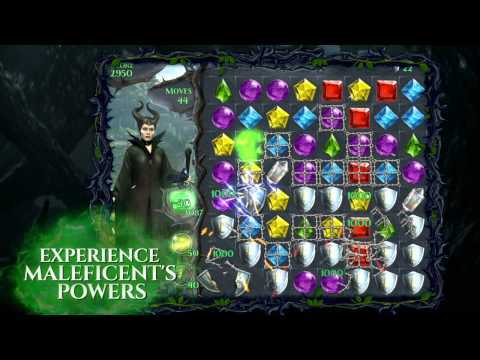 Play through a magical month-long journey to discover how Maleficent & Aurora first met! Unlock 40 mystical new levels in the Book of Moors! 40 entrancing new levels are waiting to be uncovered in the next two chapters of the Book of Moors! Play special events to start earning Power Ups as well as Magic and Lives! Ignite the candles and light your way to victory by matching gems of the same color as the candle! Unlock two new chapters of the Book of Moors to play 40 magical new levels! Two NEW Chapters are waiting to be unlocked in the Book of Moors! The Water Fairy needs more lake crystals. Play new levels NOW to help her expand her collection! Unlock two new chapters of the Book of Moors! The Wallerbog is causing mischief again! Keep him out of trouble by making matches next to the mud to hide him. Hide him enough times to beat the level. 40 MYSTICAL NEW LEVELSOpen the Book of Moors to unlock 20 new levels today, with 20 more arriving in no time! NEW DAILY EVENTSCollect all ingredients for The Magic Cauldron to create an enchanted brew. Complete the Daily Event within 24 hours & earn a reward!BRING THE HEATMatch along the new Fire Stone to set off its fiery power & clear more jewels!EXCITING NEW LEVELS40 challenging new levels unfold in the Book of Moors! 40 NEW LEVELS – WICKED!Open the next two chapters of the Moors Book & enjoy 20 new levels now, with 20 more coming soon! 60 NEW LEVELSTurn the page to unlock two new Map Chapters in the Book of Moors & play up to 60 NEW levels!BLOW AWAY THE DANDELIONSMake matches next to the Dandelions to blow them off the board and defeat the level! 40 MAGICAL LEVELS ADDED20 NEW levels to play now in the newest chapter of the Book of Moors, with 20 more to follow soon!BREAK THE ANCIENT SLATESMake matches next to the Ancient Slates to shatter them all and win the level! 40 NEW LEVELSOpen the next two chapters of the Book of Moors to unlock 20 mystical new levels now, with 20 more to follow! 40 NEW LEVELS – WICKED!Open the next two chapters of the Moors Book & enjoy 20 new levels now, with 20 more coming soon!BURSTING GEMSMatch the Bursting Gems with their corresponding gem colors to clear the board faster! NEW LEVELS & ITEMSEnjoy 40 new levels & Unlock the wonder for 2 new chapters of the Moors Book! 40 NEW LEVELSMatch your way through 20 exciting new levels now, with 20 more to come!